I don't usually drink coffee. My go-to is my beauty latte. But some days... I want to hug this old friend... this super charged old friend. I used to frequent cafes. There was nothing I looked forward to more than getting a latte and getting stuff done. And when I say getting stuff done, I mean shopping. Oh how things have changed. Not only do I shop WAY LESS (almost never except to buy groceries... I'm really into purging instead of stuff these days), I also almost never get a latte from a cafe. And when I do, I always seem disappointed because my lattes are so much better. My palate has definitely changed. I mean, I like my food and drinks to taste... real. Like real food. I am no longer into stuff that tastes artificial. Cafe lattes also leave me feeling jittery and high with an end of crashing and edginess. My lattes are fueled with fat and protein which sustains my energy and doesn't leave me crashing. When you have fat and protein with caffeine it slows the absorption of the caffeine into your blood stream, essentially giving you hours of energy. Take the fat and protein away and your system gets hit with a load of caffeine leaving you flying high and then burning out. Plus, who doesn't want some serious nourishment with their latte too?! It makes drinking it so much more satisfying. Throw everything in the blender and blend on high until smooth and creamy. Pour into your favourite mug and enjoy. 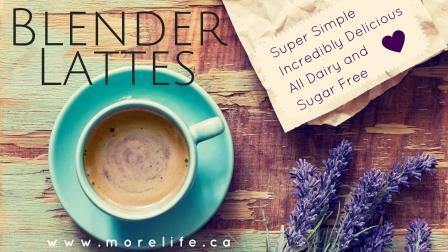 Want more amazing blender latte recipes? Perfect to keep you warm on cool days.